Pizza pleases everyone because it can be made to order. Even one pizza can be different on each side. 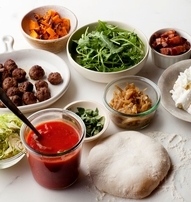 Homemade pizza dough can usually be purchased in the deli section of your groc store. Of course you can also just buy premade pizza crusts in the bread section. Your favorite marinara sauce or pizza sauce can be spread over and topped with anything (veggies, meats, pinapple?) then add shredded cheese. The standard is mozarella, but go with cheddar (and bacon?) or feta (greek anyone?). I have never had a melted cheese I didn’t like. Use what you have. Load it up or keep it light and healthy.Pizza is perfect for a night spent alone or a “Make you own pizza party” for all ages. This entry was posted in Beef, Chicken, Pork, Vegetarian by Modern Mom Meals. Bookmark the permalink.